Tomb and Thirst hails from New Haven and has been taking the Elm City on a ride through the world of Metal, doom, sludge, and grindcore. Releasing a self-titled CD late last year they are on their way to becoming one of the premier bands to see in the area. Check out an interview with guitarist Dave Lutz. How would you describe Tomb and Thirst? A therapeutic, collaborative effort between three friends. Our medium of expression could be described as emotionally intense, noisy punk rock. The new Haven music scene seems to be on the upswing. How do you feel about the current state of the “scene” in New Haven? There is a tight knit group of Doom /sludge/metal bands in the area. Are there any upcoming bands within the scene we should know about? I don't know. I don't get out much and have no idea what is going on in the world of genre specific musical styles these days. Black Sabbath or Black Flag? Black Flag. Keith Morris era. What are your top 5 favorite records of all time? I can't settle on just five. My top five records vary depending on my mood from day to day. What is your favorite club to play at past or present? The Nest in Bridgeport. It no longer exists and isn't a club but it was my favorite place to play. 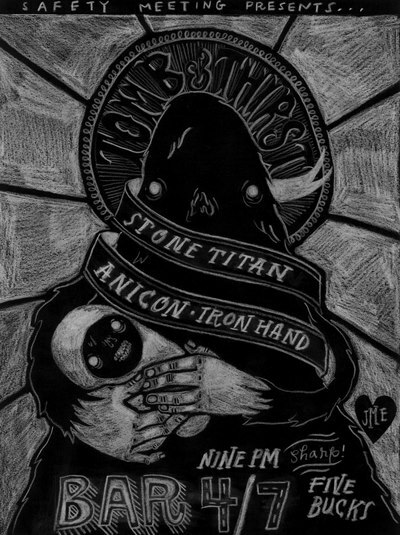 You’re playing at BAR with Stone Titan, Anicon, and Iron Hand on Sunday April 7th. For people who have no idea, what can they expect from this show? Tomb and Thirst released a self-titled cd late last year. Can we look forward to a new recording from you guys this year? Yes. We'll be recording again very soon, with a release on Safety Meeting Records planned for later this year and possibly another self released cassette or cdr. If you can put together your all time rock and roll band (2 guitars, drummer, bassist, and singer) who would the band consist of? That band already exists and they're called BROKEN.